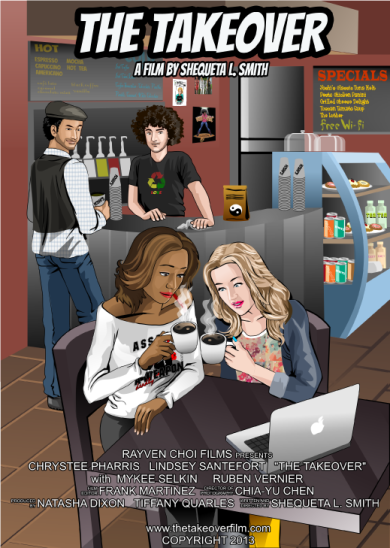 With over one-hundred thousand online hits between YouTube and Vimeo and after a busy film festival run, Rayven Choi Films’ short film, The Takeover, celebrates a successful year online. Making history as the first body swap film to swap bodies with a black and white woman, the film has quickly become a cult hit amongst viewers. 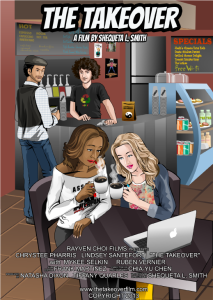 Inspired by writer-director Shequeta L. Smith’s real life dating experiences in Los Angeles, the film tells the story of best friends Ashley (Lindsey Santefort) and Tisha (Chrystee Pharris) who debate the difficulty of dating within their respective race. After they consume a mysterious espresso and go out for some retail therapy, the two awaken to find themselves in each other’s body. Dubbed as an Anti-Valentine’s day movie, this thought provoking short film presents an inventive, satirical story that bravely tackles stereotypes and delves into some pretty deep seated racial issues. The film boasts a fresh young cast, plenty of laughs, and a jamming soundtrack that heavily features Grammy award winning artist PJ Morton. The Takeover is now playing on YouTube and Vimeo. More information on the film and its filmmakers can be found at the film’s website, http://www.thetakeoverfilm.com.